place the chicken + onions + garlic + cilantro foil lined baking pan, season with salt + cumin +pepper. coat with lime juice + chile habanero sauce. cover with foil + bake, 1 hour. once cool, shred chicken in the pan juices + set aside. in a large saucepan, combine zupa noma tomatillo kale jalapeno soup + salsa verde. bring to boil + simmer on low, 10 minutes. transfer to a bowl + let cool. toss together chicken + ½ cup of the zupa verde sauce. lay tortillas in oiled dish. place about 1/3 cup of chicken down the middle of each tortilla + roll into a cylinder + lay seam side down tightly in the dish. 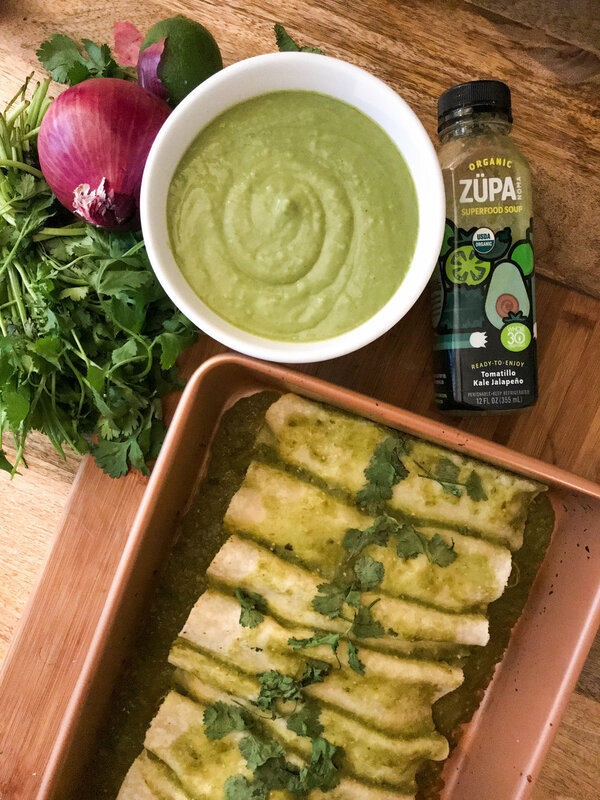 spread a layer of zupa verde sauce over the tortillas + bake, about 25 minutes. sprinkle with cilantro + diced onions + top with avocado cucumber crema. blend together all ingredients in food processor until smooth. transfer small bowl, season with salt + pepper.